CURE is joining together with dozens of organizations advocating to protect our water. We’re rallying support at the State Capitol for clean, healthy water in our great state. With new legislators and a new Governor’s administration, many elected officials are learning about important water issues for the first time. We need to make our voices heard for clean water so our long-time champions continue to support policies that protect our water — and to educate new lawmakers about water to prevent rolling back the important gains we’ve already made. Do you want to help advance clean water in our state? Do you want training from top state experts in environmental activism and policy? Register now for Minnesota Water Action Day 2019! 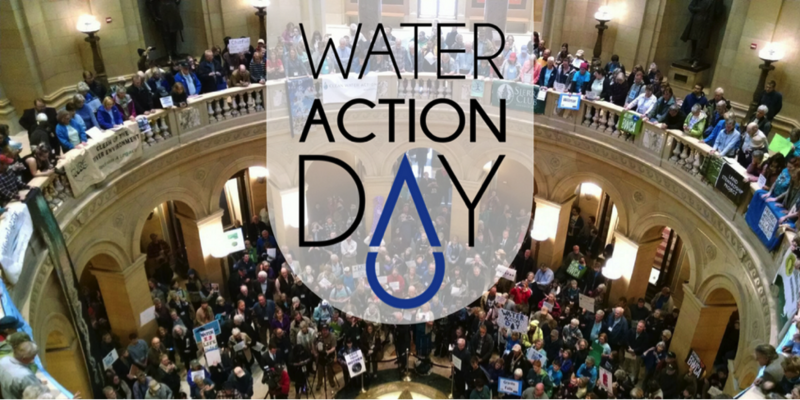 Water Action Day 2019 is a full day of public action and advocacy to let lawmakers know that we care about our water and are holding them accountable. This all-day event will include complimentary breakfast and lunch, briefings on the issues, training from experienced activists, and meetings with your legislators. We’ll cap the day off with a huge rally at the Capitol Rotunda, featuring some of Minnesota’s most powerful voices for the environment. Come for all or part of the day! This event is 100% free. Everyone is welcome. Bus/van transportation from Greater MN — Coach buses routes are being coordinated from multiple locations, including Austin, Houston, Montevideo, Bemidji, and Duluth. You can reserve a spot on your preferred route when you register with any ticket type. Bus Captains will follow up with you prior to the event on the specific timing & pick-up stops on each route.